Please join CSCE at the 12th Annual Achievement in Civil Engineering ("ACE") Awards program where CSCE will honor the planning, design, and construction achievements of Connecticut Civil Engineers. These Awards will commend projects on which significant engineering expertise or innovation was exhibited and distinguish these projects, and thereby honor the overall contributions of numerous engineers and other team members. CSCE invites engineering firms to submit an application by March 31st and participate in this Awards event where CSCE will honor the design and construction achievements of Connecticut Civil Engineers. 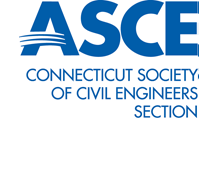 Please consider nominating a local civil engineer for one or more of the following ASCE Connecticut Section Individual Civil Engineering Awards. Nominations are also due by March 31st. These awards will be presented at the ACE Awards on May 21, 2019, and will recognize ASCE/CSCE members for their outstanding contributions to the Civil Engineering profession. CSCE looks forward to your participation in this wonderful event where several outstanding projects - and the parties who made them possible - will be recognized. Platinum Sponsorship ($2,500) includes Full Page advertisement in Dinner Pamphlet, Advertisement on Event Sponsorship Board, and Two Dinner Tables. Gold Sponsorship ($1,500) includes Half Page Advertisement in Dinner Pamphlet, Advertisement on Event Sponsorship Board, and One Dinner Table. Silver Sponsorship ($1,000) includes Quarter Page advertisement in Dinner Pamphlet, Advertisement on Event Sponsorship Board, and Four seats at the Dinner. Bronze Sponsorship ($500) includes Business card size advertisement in Dinner Pamphlet, Listing of company name on Event Sponsorship Board, and Two seats at the Dinner.